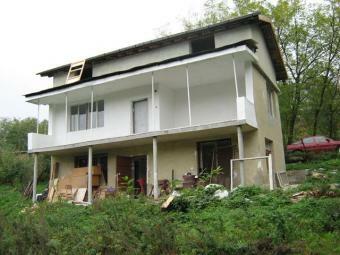 Description: This beautiful house is situated in a tranquil village at 28km from Varna town and Airport. The village is very well located in a quiet semi-mountain area near a small river. The charming village is located between two dam lakes! The British citizens had bought several real estates in the village. The size of the yard is big (1 200 square meters). A small river, bonding of the damn lakes, runs near the property. The property consists of: 1st floor: 2 rooms and bathroom with WC. 2nd floor: 2 bedrooms. 3rd floor: attic. The house living area is 120 sq. meters. The region is ecologically clean. Water and electricity are available. The house needs some finishing works. It is situated very close to the river and the nearest sea side town is Varna. Beautiful panorama from the house! The rural character of the region could be a good basis for development of alternative rural, natural or ecological tourism. The Krumovo, Zasmyano, Liuben Karavelovo, Botevo and Osenovo dam lakes and the Batova, Osenovska and Suha rivers are a precondition for developmet of sport and fishing tourism. The village is very nice and picturesque. PROPERTY IDEAL FOR HUNTING AND FISHING !